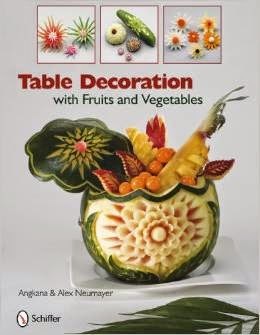 Hi Friends , here are some more great Vegetable and Fruit Carving Books I found for you all. I am sure that each one of them must be having its own selection of exquisite carving lessons so make a pick of your choice. I will not say much about this book and only post a review by one of the buyers - "I love food styling, just imagine my surprise when i saw this book, I just had to have it. When I started going through the pages and seeing the final product of an onion I became even more excited. Imagine lily from spring onions, candles from a radish, gold fish /pig from a carrot,a duck from a cucumber and so many other wonderful items all made from fruits and vegetables. The pictographs-just fantastic. All directions are easy to follow. This book just encourages you to come up with ideas of your own. I recommend this book to anyone who loves craft like myself. FIVE STARS. " 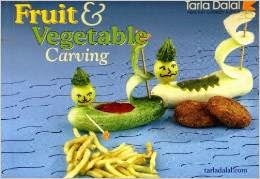 The art of fruit and vegetable carving has its roots in Asia, but today the creation of edible decorations is popular worldwide. Learn to create remarkable decorations for the table and garnishes for glasses and plates. Many tips, 440 color photos, patterns, and practical, step-by-step directions guide you through little works of art that are easy to produce. Carve a flower, shape a fish, a bell, the sun and moon. You will be adding light touches to your meals from here forward. Sculpture created from fruits and vegetables will challenge you, and amaze your guests. Simple techniques and tools make it possible to create absolutely stunning centrepieces that will be the talk of the party. Butterflies and rosebuds from colourful beets, carrots, and radishes are easily crafted. Elaborate melon lanterns and "flower" filled vases are crafted step-by-step in pictures, making it easy for you to follow the directions. Twenty-five splendid projects promise to delight dinner guests, and gratify their maker. An inexpensive hobby, food sculpture becomes a priceless addition to any table setting. This book will show you how to create imaginative centrepieces like a professional. Checking out for some more great books to bring to you,till then I am sure you will browse through this content to make the best choice! 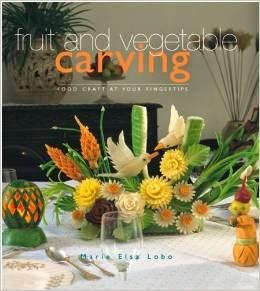 Today here I bring to you one of her Fruit and Vegetable Carving Books. 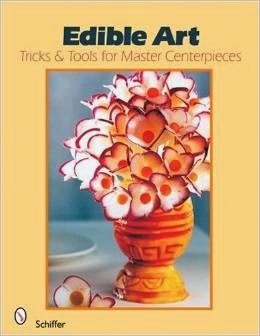 This book has a cornucopia of ideas,techniques and tricks for beginners to create easy carvings to add a special touch for their next party. One can create center pieces.characters,flowers,bouquets, birds and even candle stands instead of the traditional porcelain!